Sealants and glues are emerging as important adjunctive tools for sealing staple and suture lines, and some of these products also are being employed as general hemostatic agents to control bleeding in the surgical field. Sealants and glues are emerging as important adjunctive tools for sealing staple and suture lines, and some of these products also are being employed as general hemostatic agents to control bleeding in the surgical field. Manufacturers have also developed surgical sealants and glues that are designed for specific procedures – particularly those in which staples and sutures are difficult to employ or where additional reinforcement of the internal suture/staple line provides an important safety advantage. Surgical sealants are made of synthetic or naturally occurring materials and are commonly used with staples or sutures to help completely seal internal and external incisions after surgery. In this capacity, they are particularly important for lung, spinal, and gastrointestinal operations, in which leaks of air, cerebrospinal fluid, or blood through the anastomosis can cause numerous complications. Limiting these leaks results in reduced mortality rates, less post-operative pain, shorter hospital stays for patients, and decreased health care costs. Although some form of suturing wounds has been used for thousands of years, sutures and staples can be troublesome. There are procedures in which sutures are too large or clumsy to place effectively, and locations in which it is difficult for the surgeon to suture. Moreover, sutures can lead to complications, such as intimal hyperplasia, in which cells respond to the trauma of the needle and thread by proliferating on the inside wall of the blood vessel, causing it to narrow at that point. This increases the risk of a blood clot forming and obstructing blood flow. In addition, sutures and staples may trigger an immune response, leading to inflamed tissue, which also increases the risk of a blockage. 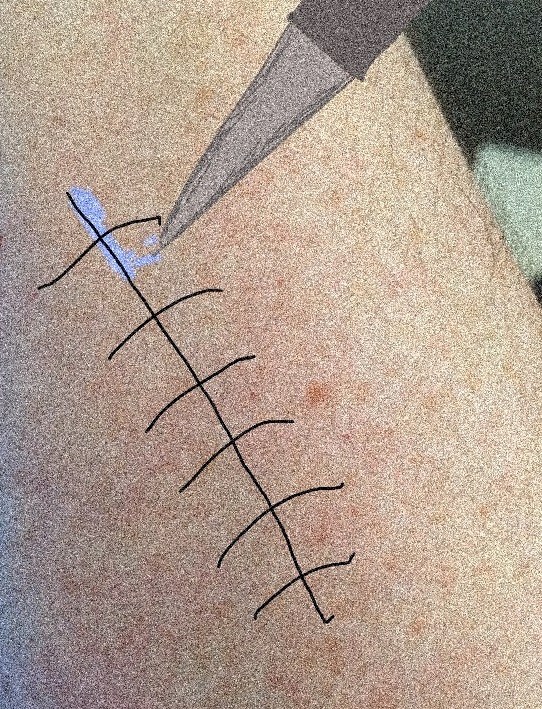 Finally, as mentioned above, sutured and stapled internal incisions may leak, leading to dangerous post-surgical complications. These are some of the reasons why surgical adhesives are becoming increasingly popular, both for use in conjunction with suture and staples and on a stand-alone basis. As a logical derivative, surgeons want a sealant product that is strong, easy-to-use and affordable, while being biocompatible and resorbable. In reality, it is difficult for manufacturers to meet all of these requirements, particularly with biologically active sealants, which tend to be pricey. Thus, for physicians, there is usually a trade-off to consider when deciding whether or not to employ these products. Closure of general surgical wounds (internal or external) is largely accomplished by a combination of surgical tapes, sutures & staples and, increasingly, surgical sealants and glues. For the reasons discussed, the rates of technology development and adoption among these causing a relative but not absolute decline of sutures and staples revenues worldwide. Surgical sealants, glues, and hemostats can be divided into several different categories based on their primary components and/or their intended use. From a practical standpoint, they may be subdivided by composition into products containing biologically active agents, products made from natural and synthetic (nonactive) components, and nonactive scaffolds, patches, sponges, putties, powders, and matrices used as surgical hemostats. 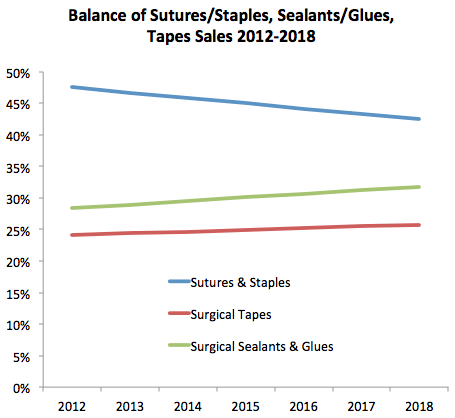 Data drawn from MedMarket Diligence, LLC, Report #S192, “Worldwide Surgical Sealants, Glues, and Wound Closure Markets, 2013-2018.” See link.